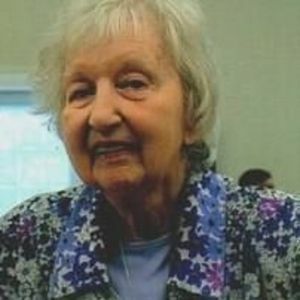 Taylorsville- Mary Henrietta Ethington Cline, 93, formerly of Statesville, NC passed away on June 24, 2017. She was born in Louisville, KY to Henry Clay Ethington and Sabina Yount Ethington. Mrs. Cline was the 1st President of the Ladies Auxiliary of Cool Springs Volunteer Fire Department in 1968. She was baptized at Abilene Church of Christ in 1953; where she taught Sunday school for thirty years. Mrs. Cline retired from Hunt Bienfang with over thirty years of valuable service. After retiring, she worked as a secretary at Northview Church of Christ. In addition to her parents, she was preceded in death by her husband, John William Cline, Sr.; and 2 sisters. Those left to cherish her memory include sons, John "Buddy" William Cline, Jr. (fiancé, Beth Coia) and David Allen Cline (Terri); sister-in-law, Sue Webster (Danny); grandchildren, Joshua Clay Cline (Diana), Justin David Cline (Kim), Mary Lenn Cline (fiancé, Gary Boaz), and Sabrina Armstrong (Andy); great grandchildren, Tabitha Armstrong, Paige Howard, and Morgan Cline; and numerous nieces and nephews. A celebration of her life will be Wednesday, June 28, 2017, 10 am, at Abilene Church of Christ. The family will receive friends on Tuesday, June 27, 2017, 6-8 pm, at Bunch Johnson Funeral Home. In lieu of flowers, memorials may be made to: Cool Springs Volunteer Fire Dept., 641 Mocksville Hwy, Statesville, NC 28625 or Hospice of Alexander County, 50 Lucy Echerd Ln, Taylorsville, NC 28681. Professional services entrusted to Bunch Johnson Funeral Home.